For an easy, versatile plant, indoors or out, it would be hard to beat an angel wing begonia, or the newer hybrid dragon wing begonia. Either one will give you flowers all summer in shade or part shade outdoors and good foliage in the winter indoors. The flowers are either red or pink and fit in anywhere you need an accent plant in a shady nook or container. Enjoy angel wing begonias throughout the spring and summer months outdoors, in containers. You can also plant them right in the ground as any other annual bedding plant. Whenever they get a little tall, which they tend to do toward the end of summer, just cut the long stalks off and stick these so-called cuttings into new pots of soil to make new plants or into the same pot they are growing in to fill out the original plant. Then in the fall, you can either let them die out with the first frost or bring them inside to brighten up your winter rooms. Versatility and easy care are their optimum features. All they require is a good soil that will hold moisture without staying wet and a shady or semi-shady environment. Full noon sun can hurt them, so make sure the shade is over them at midday. Keep them happy by watering them whenever the soil dries out. Feed them every few weeks throughout the summer months although they will still perform very well if you happen to forget to fertilize. Bring them indoors before the first frost and put them in a room where they will have bright light. Keep the soil a bit damp but don’t mist the leaves as this can trigger mildew problems. Pinch them back throughout their indoor confinement so that they stay short and stocky. Next spring move them outdoors into light shade and get ready for the pendulums of flowers to appear. 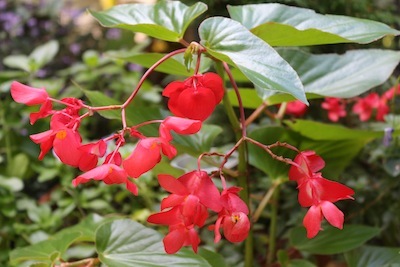 Check out next week’s GardenSmart E-letter, In The Dirt, for news about another wonderful begonia from Suntory, Crackling Fire.